Whether fair or not, it’s difficult for me not to think of Jorge Carrera Andrade’s Micrograms (Wave Books, 2011) when reading Joshua Beckman’s The Inside of an Apple (Wave Books, 2013). To begin with, Beckman helped translate Andrade’s poems; moreover, both collections contain short form poetry that focuses primarily on the natural world. The poem likens the poplar tree to a painter, its branch to a brush, honey to paint, and the sky to a canvas. The poem offers us a vision of the natural world wherein a tree becomes an artist, and its creation becomes one element of the natural world transformed into an aesthetic contrivance. Andrade manages to build all these transformations into a three line poem with a concise and economical style. While slightly longer than Andrade’s “Poplar,” the poem still maintains a compact form with its twelve lines never exceeding four words. And just as “Poplar” transforms a tree into a painter, Beckman’s turns stars into bells; but, conversely, he also turns planes and electric light into stars and tree branches. Yes, Beckman’s poem exhibits a “drunk” poetic wherein a boozy brush paints a “blue / palette of early / night” in such a way that it confuses the natural and synthetic worlds. The bucolic fantasies of poetry from ages past have passed. No longer do bees swarm fields, pollenating the flowers growing there; rather, they “buzz around” a “big plaster apartment.” Indeed, the landscape of our “mechanical world” has altered dramatically, and the poet must account for these alterations if the microgram and its newer permutations intend to “bloom” in our contemporary times. Short, terse, and image-based, the poem reads very much in the style and voice of the microgram and haiku traditions. 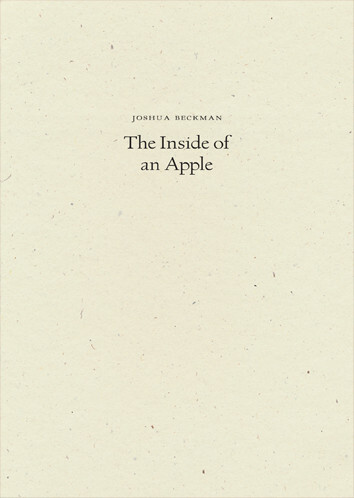 But, at least to my mind, Beckman’s poems succeed most often when they don’t rid themselves of a “subjective hue” and, instead, infuse themselves with a twenty-first century subjectivity. The most common manner in which he does this is through the inclusion of a first-person speaker who narrates his own life, such as: “I ate an apple, that’s fine / and after Anthony left I got a whiskey” (13). The use of the word “basically” helps create a conversational tone, as well as implying the lack of desire to name or discover specific details of the moon’s waxing and waning. Instead, the speaker contents himself with a “basic” assessment of his natural surroundings, affecting a voice that implies a rather cursory or off-hand investment with the natural world. Likewise, the use of the colloquial “kudos to me” contributes to a common, everyday idiom that reads as self-congratulatory in that Facebook status-update sort of way. But I mean this in no way, shape, or form as a pejorative statement; in fact, I feel this is one of the greatest strengths of the collection. The Inside of an Apple reads most vibrantly when the voice sounds current, casting off the sometimes antiseptic and somewhat stale tones of haiku and its modern derivatives. To this end, Beckman (whether consciously or not) updates the microgram even more radically than Andrade predicted through the inclusion of a “subjective hue” that, through voice, locates itself within our contemporary moment. Bashō once wrote that, “To know the pines, you must go to the pines,” arguing that one must immerse oneself within their environment if one wants to properly understand and write about it. Likewise, Andrade understood that the microgram can offer us a vision into the “deep reality” of the world around us if only we engage with it upon its own terms. It would appear, then, that Beckman absorbs his environment and its deep realities through images of natural-to-synthetic transformation and the inclusion of a voice that is distinctly of and for the twenty-first century. going to be essential to keeping your salon up and running. Stylists leave when the rent or commission no longer works for them. license and an inspection from the NYS Department of Health.